Homeschool High School with Compass! Compass has a vibrant, active teen community with a range of options for high school students. Compass offers full-year core courses, science lab intensives, semester-long classes, quarter-long classes, and workshops at the high school level. Some classes can serve as full credit courses while others can be treated as “component” classes that are bundled with other opportunities to create a full high school credit. Additional opportunities for teens at Compass include the Alpha Rho chapter of Eta Sigma Alpha, the national homeschool honor society, the opportunity to earn the annual President’s Volunteer Service Award, and teen parties. Compass high school classes are small, 6-12 person classes taught by knowledgeable subject matter experts and teaching artists. The small group dynamic allows teens to develop relationships with the instructor and class peers. The small group class structure also allows the instructor to adapt the pace of the class to the students enrolled. The homeschool family has the unique privilege to customize and chart a course of study and schedule a range of activities that can be packaged as the student’s own, unique high school experience. What better way prepare a teen for the independence of college or self-reliance of starting a career than to build a custom foundation through homeschooling! The flexibility of homeschooling high school allows a teen to tailor his/her studies to drill down on specific areas of interest or to create a broad, general base. Each homeschool family can determine how each Compass class fits into his/her child’s overall high school portfolio. A Compass class that one family identifies as a core requirement may be considered an elective element by another family, or simply an enrichment activity by another. The homeschool family can mix and match Compass classes with other opportunities such as online courses, independent study, dual enrollment, work-study, individual or group projects, internships, travel, reading lists, volunteer work, etc., to complete a high school credit. For classes noted as 9th-12th grade, accelerated 8th grade students (grade if enrolled in traditional school by birth date and age 13 by September 30) may register for the class subject to Compass’s age/grade placement guidelines in the Compass Family Handbook. 8th grade students (13 years old) must be socially and emotionally mature enough to participate in high school level discussions and complete high school level readings and workload. 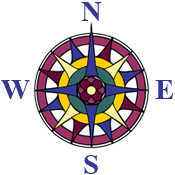 For students younger than 8th grade or age 13, parents must consult with a Compass administrator before enrolling.